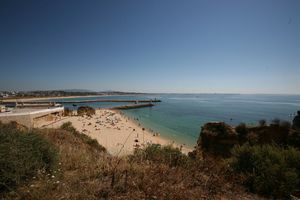 Spend a day in the renown Praia da Batata Beach, in Lagos, Algarve. Praia da Batata is a urban beach located between Praia dos Estudantes and the western dock of Ribeira de Bensafrim, few meters away from the historical centre of Lagos, the Algarve. Behind the sandy area appears a cliff with a stately stone-paved square, traversed with a beautiful seaside walk, offering several leisure activities. After the dock, you will find a small and lesser known sandy area. This part is Solaria and the Fortaleza da Ponta da Bandeira, nowadays closed to the public. The sandy area features many concavities and sheltered areas due to the rocky formations and the cliffs. 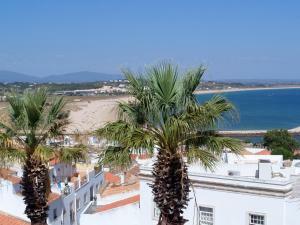 This is a very lively beach, since it is located as a continuation of the great Litoral Highway of Lagos. Parking, restaurants, WC, and summer surveillance.